Victor’s wife, Fyllis Hockman, having lunch with a monk in Myanmar. 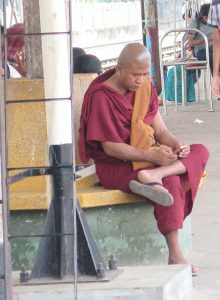 My first surprise was that a Buddhist monk in Myanmar (Me-un-mahr) spoke English, although our guide did have to translate some of the discussion that my wife Fyllis and I had with him. Imagine, then, how astonished we were when he pulled a Smartphone from the folds of his saffron-colored robe and showed us photographs of his recent trip to Japan. Myths and Mountains, the company with which we traveled to Myanmar, promises journeys that “explore and experience.” Our chance meeting with Aung Pan Kyaung Tike, the English-speaking monk, was but one fascinating encounter which supports that claim. We met Aung Pan while visiting the vast Shwedagon Pagoda complex, the most sacred Buddhist shrine in a country of countless Buddhist holy places. His invitation to lunch at the monastery he leads turned out to be one of numerous high points of our trip — and underscored the fact that the people of Myanmar (called Burma until the ruling military junta changed its name in 1989), are among its most interesting and intriguing attractions. No one knows how many Buddhist monks live in Myanmar. No one knows how many Buddhist pagodas, temples, monasteries and dome-shaped stupas (stoo-puh) are scattered about the country. Nor how many monks live a life of meditation, prayer and walking through their community with a “begging bowl” into which people seeking to do a good deed put a bit of food. Yet if the pervasiveness of religion in everyday life leads to an assumption that Myanmar is only about religion, think again. In fact, it’s a multi-racial country with interesting cities, intriguing villages, stunning nature and attractions sure to delight even the most intrepid traveler. Against this backdrop, interactions with the people provide many of the most memorable experiences. For starters, the population includes 135 nationalities, and members of each of them cling proudly to their distinctive dialect, way of dress and traditions. It’s not unusual to come across ethnic minority people in large cities. Yangon, formerly known as Rangoon, is the biggest metropolis. It boasts the largest number of colonial-era buildings in southeast Asia, a reminder of Britain’s control of the country from 1824 until it gained independence in 1948. Workshops are where skilled men and women turn raw materials into products that are beautiful and useful. Mandalay, the second largest city, was the last seat of Burma’s kings before British colonization. In addition to the de rigueur religious relics, it’s renowned as a center of arts and crafts, with different neighborhoods devoted to various trades. The small workshops where skilled men and women turn raw materials into products that are as beautiful as they are useful provide a window into one important part of the local lifestyle. Workers toil long hours, often for wages in the $3 to $5 a day range. We visited a shoemaker and silver smith, workshops for textiles and teak furniture, shops where people were casting bronze and carving wood. Everyone we observed exhibited a high degree of skill and took pride in their handiwork and finished products. Even among such a varied sampling of mini-factories some linger in our memories. We were told that the shoemaker is the only one in the country who produces special footwear for people with a disability. At the jade workshop and open air market, large green and white slabs are cut, chiseled, polished and washed to produce the tiniest of gem stones. Workers in a marble marketplace carve, hammer, scrape and wash images, most of Buddha, in various sizes and poses. Visits to the workshops provided an introduction to the challenges that working people in Myanmar face. Many tasks are very labor intensive. We watched a man spend a full day cutting a lawn at a resort with a hedge trimmer, a task which could have been completed in an hour or so with a power mower. Young men wield heavy hammers for hours on end to pound slabs of gold into paper-thin leaf. Women toiling at road repair projects somehow manage to carry large, heavy rocks on their head. Outdoor markets fill sidewalks and streets. A scene very different from the workshops awaits visitors to the ubiquitous outdoor markets that fill sidewalks and streets in cities, towns and villages. These are good places to meet and mingle with colorfully attired members of minority groups, some of whom are there to sell and others to buy. Sidewalks are blanketed by vendors’ stalls and streets are clogged with locals doing their shopping. Items are displayed on rickety stands and tiny tables and in some cases spread out on the pavement. Clothing may be next to flowers and near parts of animals, some of which were unidentifiable to me. 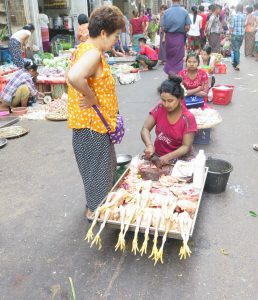 Goods that range from cooking oil to curry powder, fish to fowl, beads to baskets are displayed, inspected by passers-by and, occasionally, purchased. These are among images of people and their lifestyles that Fyllis and I encountered in Myanmar, and which long will linger in our minds. Along with lines of monks walking with their begging bowls, members of ethnic groups wearing their colorful clothing and people bowing and genuflecting before Buddha images that look down upon them throughout the country. Myths and Mountains operates tours and custom trips to Myanmar and a number of other destinations in Asia and Southeast Asia. For more information call 800-670-6984.